It’s Friday! Time to let it all out and write for five minutes straight—no editing allowed—about whatever prompt The Gypsy Mama serves up. Today the theme is “Waiting…” (is she in my head?). Ready? Go! I have always loved the delicious sort of waiting that involves something specific—a birthday, a vacation, a dinner party. But the older I get, the more waiting seems to be about unknown things that can’t be put on a calendar. I am waiting for a sign, for direction, for a change of heart in me or someone else. I am waiting for God’s promises to become reality, or waiting to feel the kind of hope and peace that tell me I actually believe in his promises, even though I don’t always know what they will look like when they materialize in my life. One of the hardest things about waiting, right now, is not knowing exactly what I’m waiting for, or if I’m waiting for the right thing. I want to be able to move forward in faith, and make the life I want to live—the life my soul craves—a reality. Sometimes that is a product of impatience, but I think it can also be a product of expectancy and hope. That’s the kind of waiting I want to do—not waiting for something specific that might not even be mine to wait for, but the expectant, open-minded, open-hearted kind of waiting, that is paired with action and movement. I can relate to this right now. I feel like I’m waiting, but don’t even know what I’m waiting for. I’m quite certain there’s a lesson in here, and I’m also certain I’m delaying the realization b/c I’m too busy contemplating the wait. I like things in black and white, I like to know, I like to plan. It’s humbling being a situation where I can’t do much but trust that what’s coming to me will arrive in its own perfect time. I love your last paragraph. So many times I am waiting for God to do what I want, or what I have planned, when I need to learn to trust in His direction. Great post! 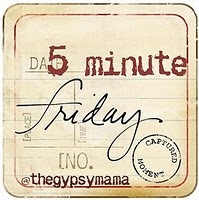 I’ve been thoroughly enjoying your “five-minute Fridays.” Gypsy Mama’s prompts (which I only know about from reading your blog) are always thought-provoking, and I love reading your responses. Clearly, from the responses posted already, this topic of “Waiting” strikes a chord! What if the train isn’t coming? What if whatever it is we’re waiting for is never going to happen? Maybe the best way to pair expectant, open-hearted, open-mindedness with “action and movement” is to think about how things would be different if one knew for certain that there was no train. Which isn’t to say that the things we wait for don’t exist–only that maybe the thought-experiment of life-without-waiting will help us break past some of the stasis that waiting often produces. Wow, I could have written this! The one clear message I have gotten from God for the last several years is “wait.” Sometimes I am comfortable in it but most of the time I am very human – impatient and anxious because I don’t want to wait! And what exactly am I waiting for?? A lot of my faith/prayer life is centered on increasing my trust in God and accepting his direction. I’m really enjoying your Five Minute Friday posts too! This prompt was hard for me, for some reason… but I think you got something very true here. Waiting is sometimes just an open expectancy, more than that looking forward to some thing or event. It’s a truth I’ve been feeling a lot lately too. Susan, this seems like a very wise insight: “I’m also certain I’m delaying the realization b/c I’m too busy contemplating the wait.” As you said, the only “cure” is to let go and trust. Is it possible to be so trusting in our waiting that it doesn’t even feel like waiting any more? Carrie, somehow it seems to me that you are not troubled by this waiting and not-knowing, but rather feel a sense of expectancy and peace. I hope my suspicion is correct! Dianne, yes, it’s easy to get all kinds of big ideas and expectations in our heads, isn’t it? Thanks for reading and commenting! Violet, it’s really too bad that we had to be created as such impatient creatures, isn’t it? Although if you think about how crazy life would get if it wasn’t broken up by these periods of waiting, that sounds exhausting! I’m glad I’m not the only one learning about this whole trust thing. dang, girl, you’ve described my life for the last five years…I am thankful that I feel that season of waiting has passed (for a time) but I think of it often…mostly because I don’t want to leave it behind in a forgotten heap, but allow that time to truly shape my character into a more resilient, flexible, and content soul. So, in some ways, I guess I’m still waiting…in hopeful expectation that I can still be molded.